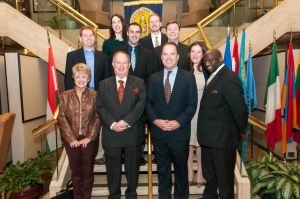 The 2014 National Press Club Board includes (first row, l-r): Governor Frederica Dunn, President Myron Belkind, Vice President John Hughes, Secretary Andrea Snyder, Governor Jeff Ballou; second row (l-r): Governor Joseph Morton, Treasurer Thomas Burr, Membership Secretary Marc Wojno; top row (l-r): Governor Molly McCluskey, Governor Anthony Shop. Myron Belkind, who worked as a foreign correspondent for four decades of his journalism career, wants to give the National Press Club a more global focus. Belkind will have a chance to implement his vision as the Club’s 107th president, a post he won in the organization’s Dec. 13 election. He will assume the office at the Jan. 17 Club general membership meeting and will be inaugurated at a Jan. 25 gala dinner, which this year will have an international theme. The former Associated Press bureau chief in Kuala Lumpur, New Delhi, London and Tokyo returned to the United States in 2004 and soon joined the Club. In 2005, he was appointed chairman of the International Correspondents Committee, where he increased the number of international members and activities at the Club. In remarks following the vote on Dec. 13, he recalled the South African Night  organized by the international committee in November 2012 that honored the life and legacy of Nelson Mandela, an event that is featured in the Club's 13th floor display case in remembrance of the South African leader who died Dec. 5. “My goal in 2014 is to build on that model of having the National Press Club as a global professional center in the city that is considered the world’s capital,” Belkind said. Belkind ran unopposed for the Club’s top office. Of the 195 ballots completed in the election, 153 votes were cast online. It was the first time the Club offered electronic voting. Others who were elected to leadership positions were John Hughes,  vice president, Bloomberg News; Andrea Snyder, secretary, Bloomberg News; Thomas Burr, treasurer, Salt Lake City Tribune;  and Marc Wojno, membership secretary, Kiplinger Washington Editors Inc. The Club also elected four members to the Board of Governors  – Jeffrey Ballou, Al Jazeera English; Alison Fitzgerald, The Center for Public Integrity; Molly McCluskey, freelance journalist; and Anthony Shop, Social Driver, who will represent the Communicator members. During his nearly 10 years of membership in the Club, Belkind has served as the Club’s secretary, treasurer and vice president. He credited relationships he established at the Club with helping him find a position at The George Washington University School of Media and Public Affairs, where he currently teaches, and with giving him opportunities to conduct media training in emerging democracies in Eastern Europe and Central Asia. “This would not have happened had I not joined the National Press Club, and I offer that as evidence of why the Club is so unique in what it can do for its members,” Belkind said. Prior to joining the National Press Club, Belkind was president and chief executive officer of the Foreign Correspondents Club of Japan, president of the Foreign Correspondents  Association of South Asia in New Delhi and president of the Association of American Correspondents in London.